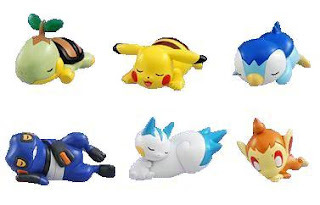 Tomy released Pokemon dazing pose 6 figures on 27 December. Box package, random assort, figure size is same as Tomy MC 2 inches. Assort clear version randomly. For Tomy Pokemon figure fans, new site "Tomy Pokemon Figure Navi" is now running please check it ! 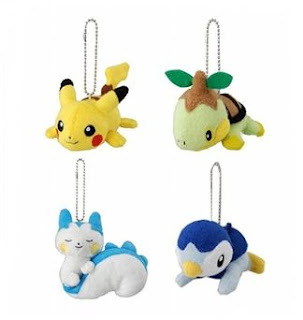 Pokemon mini plush key chaine will be introduced by Tomy at 27 December, Pikachu, Turtwig, Piplup and Pachirisu 4 kinds. Size is approx. 2.7" height. Tomy will offer the prize, new color version (Shiny Pokemon) figures, starting January to March, 1000 winners by lottery every month. How to apply is sending three piece of bar codes on the Tomy MC's case to Tomy Japan. Bandai Pokemon Kids series 'Attacks learned' 08, will release 14 figures in end of March. 'Attacks learned' is Pokemon Diamond Pearl version. 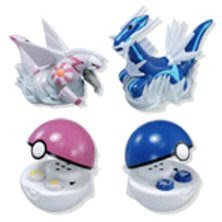 As for 07, posted to Pokemon Figure Release Info in September (Bandai PokeKids). New Pokemon plush, Arcanine and Luxray are introduced by Banpresto at 14 December. Size is approx. 5.5-6" height, game prizes. This is winter series, other plush will come every week till January. Bandai Pokemon Kids DP6, a photos (8 Januaryr release figures) is uploaded. Yujin 3D Pokedex Series DP07, will release 18 figures/７sets in March. Updated summary list of released figure, refer to Pokemon DP figure release summary. If want to see other Zukan series, please refer to Pokemon Yujin 3D figures. Release of Yujin 3D Pokedex DP06 was postponed to January. Bandai Pokemon Super Get Series 15, will release 10 figures of Pokemon DP in March. Updated summary list of released figure, refer to Pokemon DP figure release summary. Release DP figures (#387-#491) will be full completed 105 pcs in this month, except for Shaymin, Arceus. Photo for Bandai Pokemon Super Get Series 12, figure release in December is uploaded. Photos for Pokemon Figure Release Info in December (Yujin 3D) is uploaded. New Pokemon plush, Probopass and Nosepass will be introduced by Banpresto at 5 December. Size is approx. 5.5-6" height, game prizes. This is winter series, other plush will come every week till January. New Pokemon plushes of Snover, Leafeon and Glaceon were introduced by Pokemon Center at 1 December, size is approx. 5.5" height. As for TomyMC figure, Glaceon isl released in April, and Leafeon in May. Tomy will release Glaceon and Leafeon plushies in October and November. Please refer to this plush info. Tomy released Remote-Controlled figure Dialga and Palkia at 8 November. Remote-Controlled by infrared, using Button cell (LR) x 8pcs. Figure size is approx. 2.5" height. 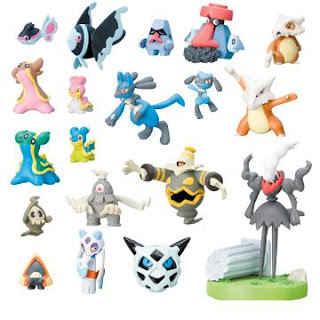 Revised previous post Pokemon Figure Release Info in January (Bandai PokeKids). Bandai Pokemon Kids series DP6 will release 14 figures, not 13 figures. Missing Empoleon.